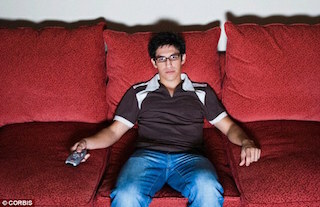 Home » Blog » Is Binge-Watching TV Costing You Sleep? Last year we had a feeling all the multi-episode consumption was cutting into some viewers’ sleep time so we ran a survey to see how much sleep people were losing. The results? Not only did the majority (55%) of respondents admit their marathon TV sessions were costing them up to three hours of sleep in a single evening, a large number of students (82%), workers (46%), and moms/dads (23%) said the lack of sleep was affecting their schoolwork, jobs, and parental commitments. 44% of all respondents said the sleep they lost to binge-watching negatively impacted their relationships. This year, to help you get a good night’s sleep, Sleeprate recommends you turn the TV off in the middle of an episode so you aren’t intrigued to continue watching after the cliff-hanger at the end. That Netflix series can wait. What shows are keeping you up at night? Game of Thrones? Justified? Mad Men? Tell us on Facebook.com/Sleeprate or join the conversation on Twitter by following @SleepRate.